Indian fusion wedding suits are the latest trend for Indian wedding occasions. They are ideal for any kind of special affair and functions. Wedding Suits look good on everyone and is liked by all ages. Young boys prefer wedding suits as they are stylish and very fashionable. They are carved with traditional hand embroidery. 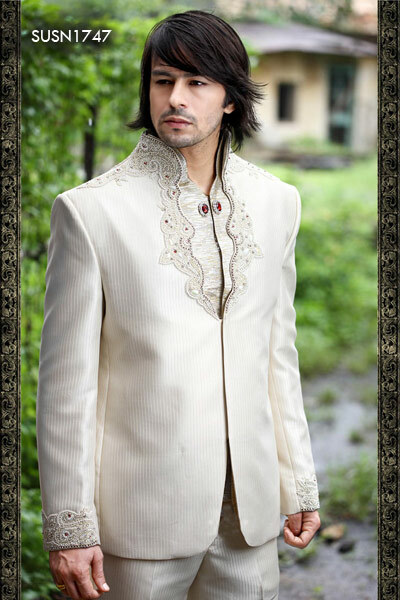 The main feature of these fusion wedding suits is the style of the collar. Jewel neck, Chinese collar, V-shaped opening is the most popular ones. 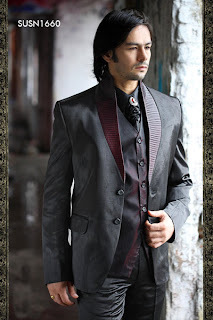 Be ready to floor the crowd in this black shade three piece suit. Black shade blazer features subtle self vertical stripes. Collar with neckline is in reddish black shade pleated pattern. Waist coat is double shaded in shades of red and black and is matched with a black shade inner shirt. It is paired with matching trousers. Fabric used is fancy satin. A desirable suit for a deserving man! Pristine white shade blazer features rich embroidery on collar and neckline using sequins, zari, zardosi, beads and stones. Sleeves are selectively patched with pleated patterns and embroidered patch to enhance the look. It is paired with matching trousers. Fabric used is self colored jacquard striped suit fabric. 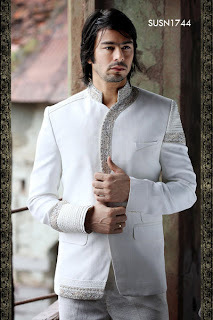 HomeIndia offers a wide range of Designer wedding men suits online.